It has been argued that fraternities today do not uphold the same ideals and beliefs as they once have. 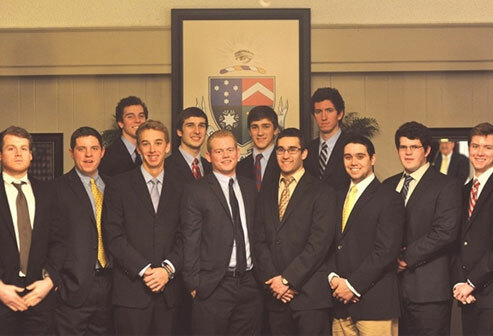 In recent years, the image of the American college fraternity has been severely scrutinized. Though, according to Nick Syrett, a professor at University of Northern Colorado and author ofThe Company He Keeps: A History of White College Fraternities, fraternities’ early years were “a time when brothers were certainly no strangers to alcohol but when Greek life was also significantly different in many respects”. And he’s right. A popular website, www.greekrank.com, gives visitors the chance to rate the fraternities they’ve visited in a number of categories—but academics and integrity are not among them. The available rating categories are: looks, popularity, classiness, involvement, social life and brotherhood. Today, many universities are cracking down after more than 125 recorded hazing deaths since the 1800’s and 36 reported rapes at fraternities in just 2014 alone. Wesleyan University gave their on-campus fraternities the choice to become coeducational or be shut down. Clemson University suspended all fraternity activity after a member’s fatal plunge from a bridge. Middlebury College abolished all fraternities after a battered female mannequin covered in blood-tinted paint and flashing a sexually charged slur was hung out of a fraternity’s window. Is this the direction fraternities are going? Is the public getting the wrong impression? Do fraternities still uphold core values and morals? How would you feel if your fraternity was shut down? Let us know in the Facebook comment box below!